This will be the last weapon from Military Silver Pack implemented. Basically BaseWeapon is finished now and adding new weapons is really easy. What’s new in this post is camera shakes which can be used on explosions or big weapon fire effect. Open WeaponType enum and add RocketLauncher there. WeaponType is used on AnimationBlueprint so if you are adding weapon which will have different hands animation you need to add new type here. Open hands skel mesh (Hero_FPP) and add new socket named S_RocketLauncher to b_RightWeapont bone. Basically if you implemented rest of the weapons you know exactly what do to now. 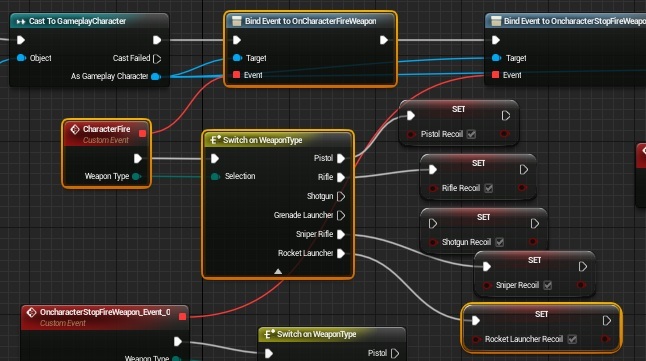 In event graph Initialize Animation add RocketLauncherRecoil on FireWeapon. And in UpdateAnimation drive RocketLauncherRecoilAlpha. Interpt Speed is different here than in other weapons. Now create new blueprint extending from BP_BaseWeapon name it BP_Weapon_RocketLauncher. Set WeaponMesh component to Rocket_Launcher_A. Now open ShooterGameInstance and add this weapon to Inventory_Backpack so you can choose it and equip. Create new blueprint extending from ImpactEffect and name it Impact_RocketLauncher. 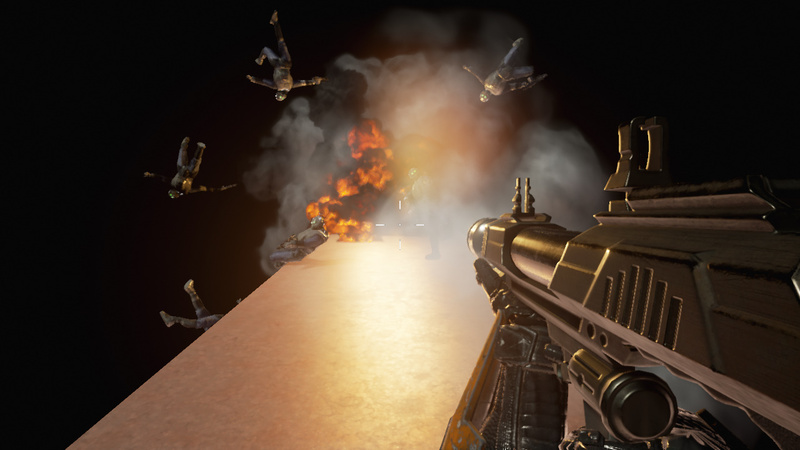 Create new blueprint extending form BP_BaseProjectile named BP_Projectile_RocketLauncher. Create new blueprint extending from CameraShake. Name it CameraShake_RocketLauncherFire. Now in event graph create Event Fire. Now you can create new AmmoData in ShooterGameInstance for rocket or just fill AmmoData in weapon blueprint.